For those interested in exploring the world, a new southern Utah travel program is pairing hopeful explorers with trip experts to make touring the world easy and educational. Southern Utah University Community on the Go explorers recently returned from an incredible excursion to Peru led by SUU experts Dr. Emily Dean, history, sociology, and anthropology department chair and an archeologist specializing in the prehistory of the Andean region of South America, and Iliana Portaro, an assistant professor of Spanish. The participants enjoyed embracing and learning about Peru as they dived into various cultural experiences. Trip leader Dean even took four adventurous travelers on a four-day trek through the Inca trail to Machu Picchu. While in the “world’s best culinary destination,” groups members indulged in the diverse and flavorful cuisine. The group took a one-of-a-kind cooking class in Cusco and learned how to make a traditional Peruvian dish, drinks and dessert. While the trip, food and sights were amazing, travelers said it was the trip leader’s expertise that made the trip such a great educational experience. 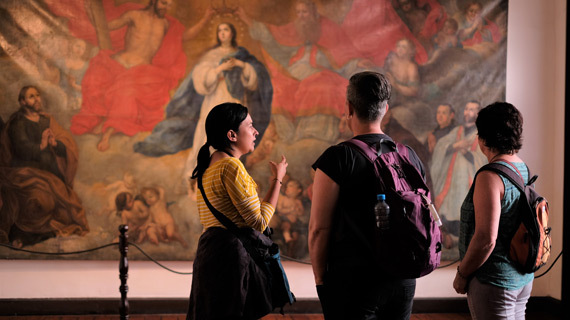 Dean’s knowledge allowed her to share insights with the group as they visited the ancient ruins, and Portaro’s deep understanding and expertise of the Peruvian culture helped travelers to open their minds to South American lifestyles and values. Community on the Go trips pair community members with SUU experts for affordable, educational travel to domestic and international destinations around the world. Other trips happening in 2018 include, “Art and Broadway” in New York City in November and “Christmas in the Alps” of Germany and Austria in December. Activities and itineraries are flexible, and trips are open to the public until filled. For more information, or to reserve your spot on an upcoming trip, visit the Community On the Go website, email communityeducation@suu.edu, or call the SUU Office of Community and Academic Enrichment at (435) 865-8031.